When we make mistakes in a game, we learn from them. We’re able to improve and adjust, to figure out how the system responds to our input. 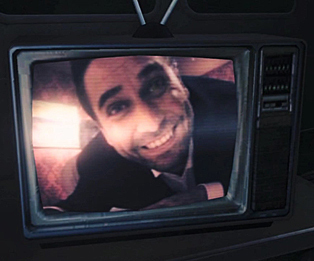 We learn the rhythm of combat – here, as in the original Alan Wake, a mixture of blasting off opponents’ protective shields of darkness using light and then shooting them with a gun until they explode. 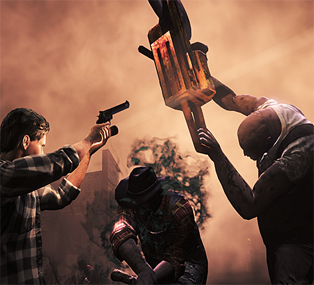 If you’re into that combat, there’s plenty of it available in the wave-based mode that Alan Wake’s American Nightmare was originally built on. There is more enemy variety in this downloadable title (the reduced production resources are absolutely crucial to the structure of this game) than in the original, and it still involves a lot of situations where an NYC writer is gunning down working-class-uniform-clad enemies like firefighters and oil rig workers. Because aiming and focusing your flashlight on an enemy to burn away its darkness are the same action, you sometimes have to decide whether to stop fine aiming to blind fire while your light recharges, or to quickly hit a button to replace your flashlight’s battery so you can continue the charge. Things get a little messy when we try to tell certain kinds of stories with games. Players move linearly forward in our own reality’s time, even as the game’s reality resets itself with every (often combat-based) failure. Usually, the player is privileged in knowing that these things have happened before. Sometimes (Sands of Time! ), the player-character knows as well. Wake and the three women he encounters in his adventure (a new-agey mechanic, a physicist and a film festival curator) know something weird is going on – an effect of being touched by the Darkness, apparently. You can have characters discuss fate, their ontological status, but pulling off a lowbrow Rosencrantz and Guildenstern are Dead can be tricky. This kind of self-awareness can be lazy, like using ironic distance to dodge accusations of naiveté. When Wake writes something that seems like a mean-spirited caricature, does that excuse the developers for using it? And when he writes, “Everything is as real as everything else,” does it justify characters who speak in philosophies? There are at least four going on at any one moment in American Nightmare: one you play, one you watch, one you listen to and one you read. Wake’s loopy (pop-Borgesian?) trip through the Arizona town that’s become Night Springs contains them all. Mr. Scratch, the Darkness embodied as Wake’s doppelganger, is an exhibitionist Mr. Blonde and has videotaped himself torturing victims, waxing philosophical about his work. These videos, shot in the motel that Wake visits in the game’s first chapter, are full-motion video (!) played on TV sets that Wake finds throughout the town. Radio interviews give an update on the post-Alan lives of several of the original game’s characters, and the manuscript pages tell backstory and current story, which foreshadow what’s to come and flesh out what’s already happened. The game and the “manuscript” vie for control; the manuscript purports to explain everything, to be what causes the events of the game to happen. But it’s obviously in the game it describes – it’s the tension that arises from inserting a tightly-authored story into something that ostensibly interprets the player’s actions. When Wake’s manuscript talks about how writing is different than music or interpretative dance in its specificity, it’s not too difficult to slot a game’s systems in with the latter two forms as well. As Wake’s story loops in on itself, the pacing quickens. Sequences become shorter, speeding up the rhythm of events as you move toward the conclusion. Sometimes things change a bit, theme and variation. We learn with each repetition; it might not be knowledge that we can apply to figuring out the game, but we can apply it to figuring out the story. Wake isn’t a mathematician or a physicist. He’s no chess whiz, no master of Go. He’s a hack writer, one who got his start on a TV show. So his game is not one of systems, but of reruns and rewrites. A game of drafts. Brian Taylor is aware of the complicated relationship between drafts and final copies – each of his tweets @brianmtaylor goes through at least four rewrites.